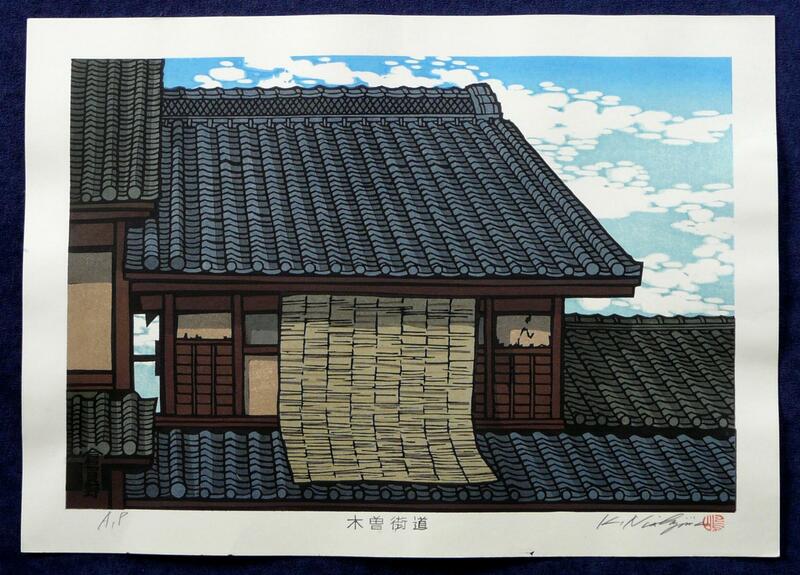 KATSUYUKI NISHIJIMA was born in 1945 in Yamaguchi Province of Japan. 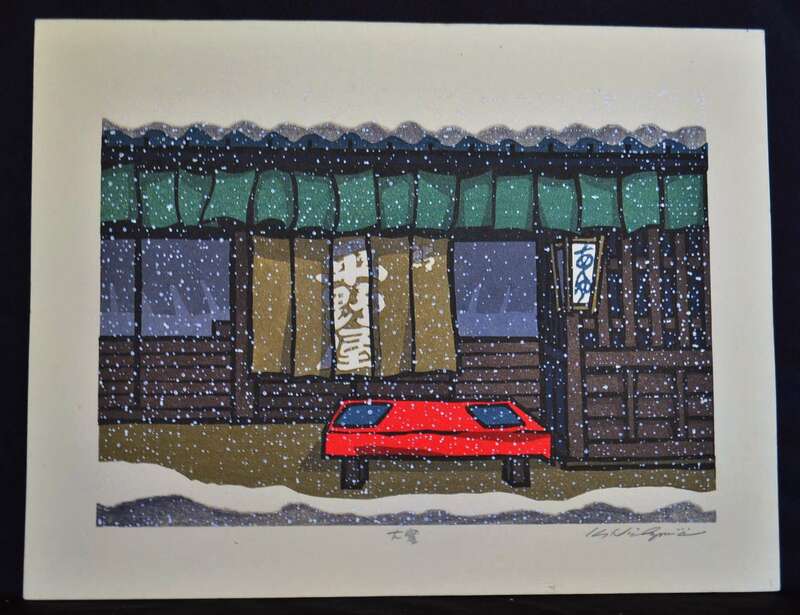 From 1964 to 1968 he studied the art of Woodblock Prints in the studio of the Mikumo publishing house in Kyoto as well as exhibiting his work with the Kyoto independent artists and in solo displays. 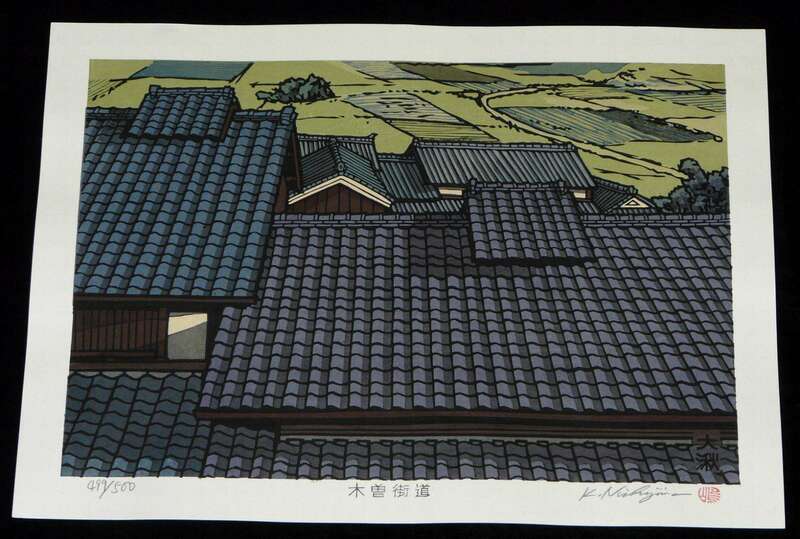 From 1972 he focused his immense talents on limited edition woodblocks using traditional old buildings as his main subject matter. 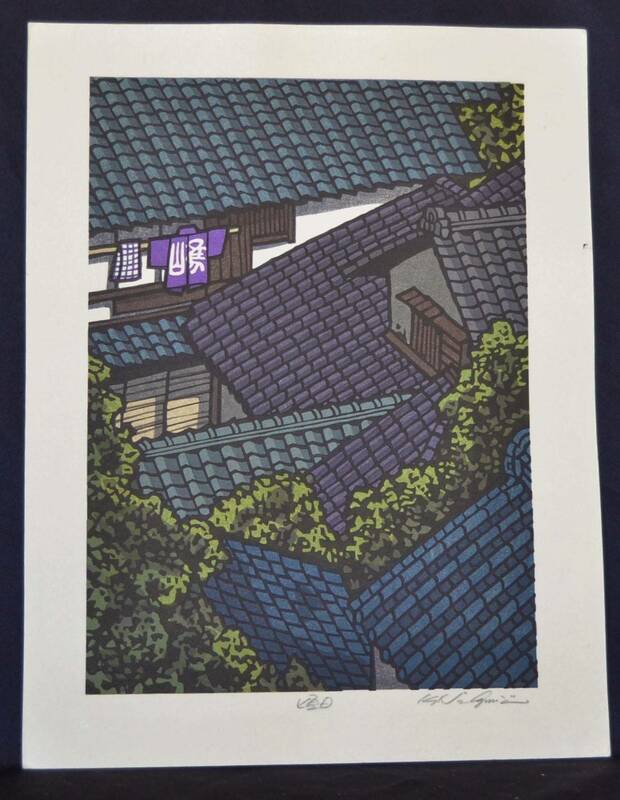 Katsuyuki Nishijima is now based Kyoto and his woodblocks come in a number of formats, the larger sizes are almost always limited editions of 500, all hand signed, titled and numbered but normally never dated. 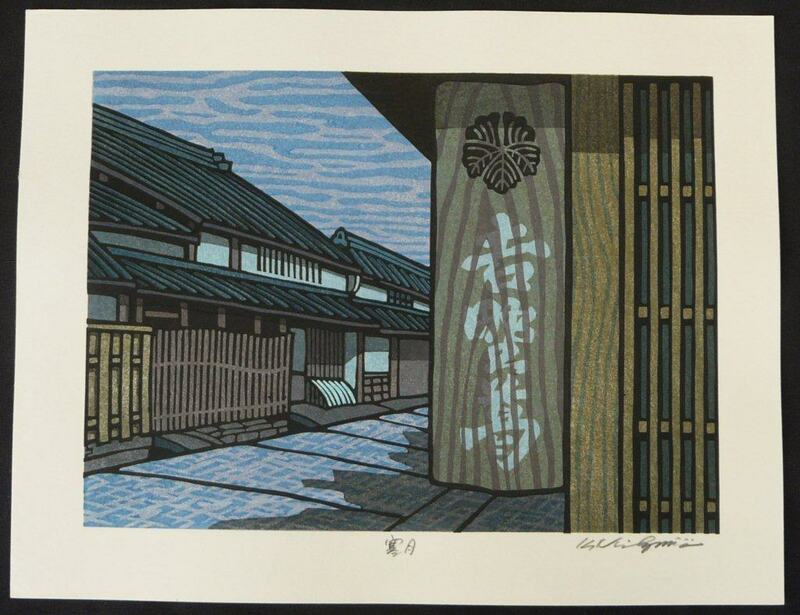 His smaller sized woodblocks are hand signed and titled and open editions, again not dated. These First Edition scenes are all Hand Signed and Titled in Pencil by the artist in the bottom margin. 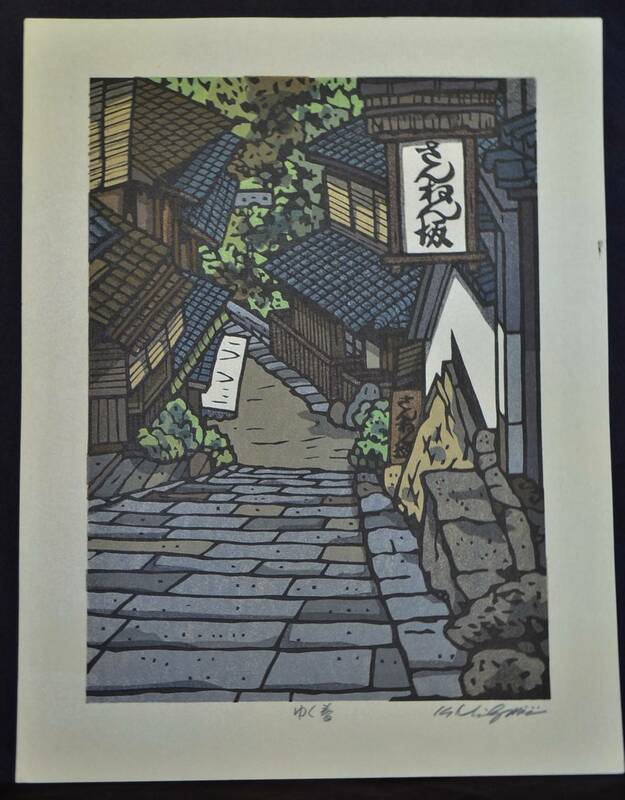 They each measure 33cm x 25.3cm (13 inches x 10 inches) and the carved woodblocks which were used to print them have been worn out for a number of years so these scenes are no longer available for purchase direct from the artist. 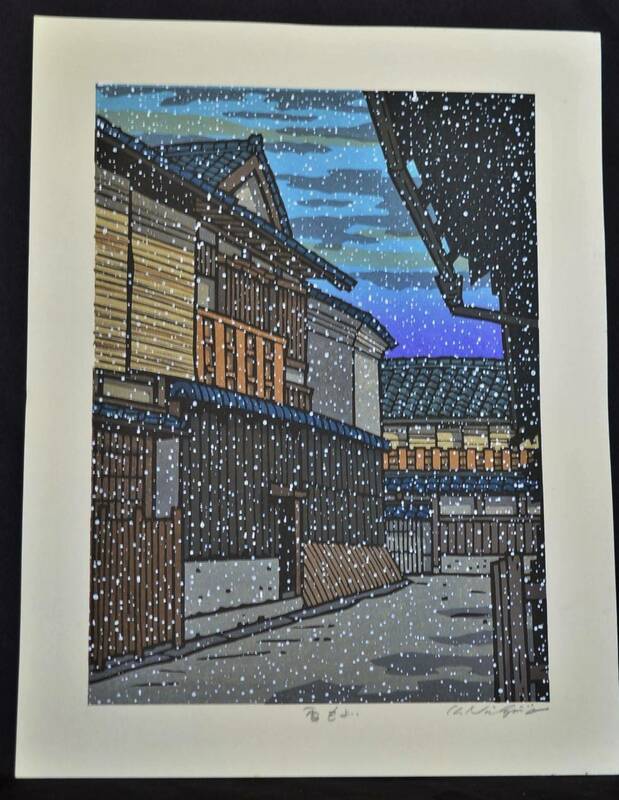 Most are now almost impossible to find in Japan and if any can be found they must be purchased from woodblock print dealers who have had them archived for many years so the prices of individual scenes varies depending of the vendor. 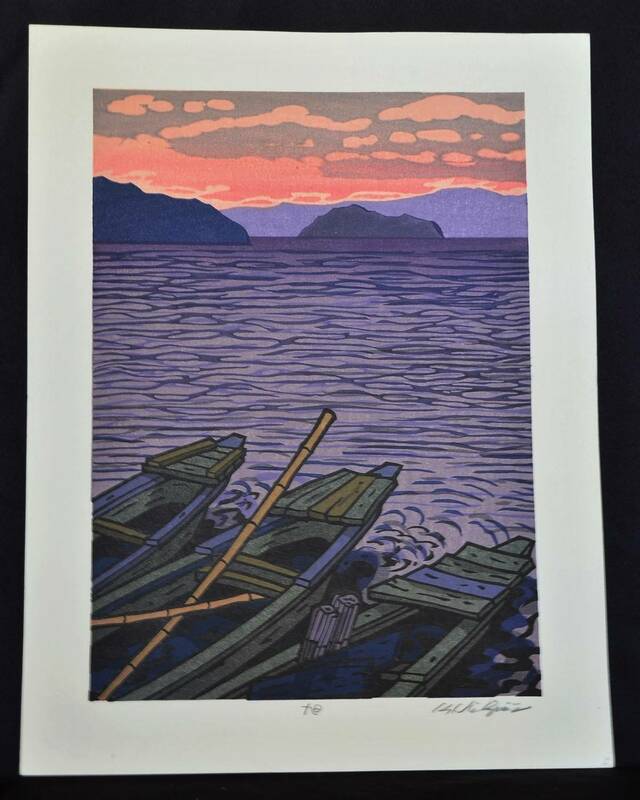 The scene is Takeojima Island in Imazu. This was Nishijima’s most famous scene and it is almost impossible to find now. The scene is in Shinbashi, Tokyo. The scene is Shiogon in Kyoto. 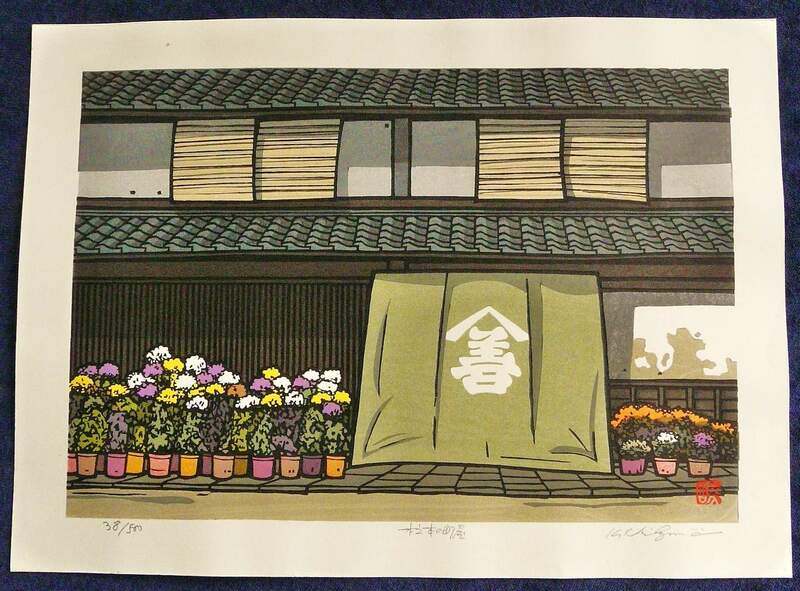 An example of Nishijima’s humour can be seen if you look at the kimono jacket hanging from the balcony which has the word Shima written on it. 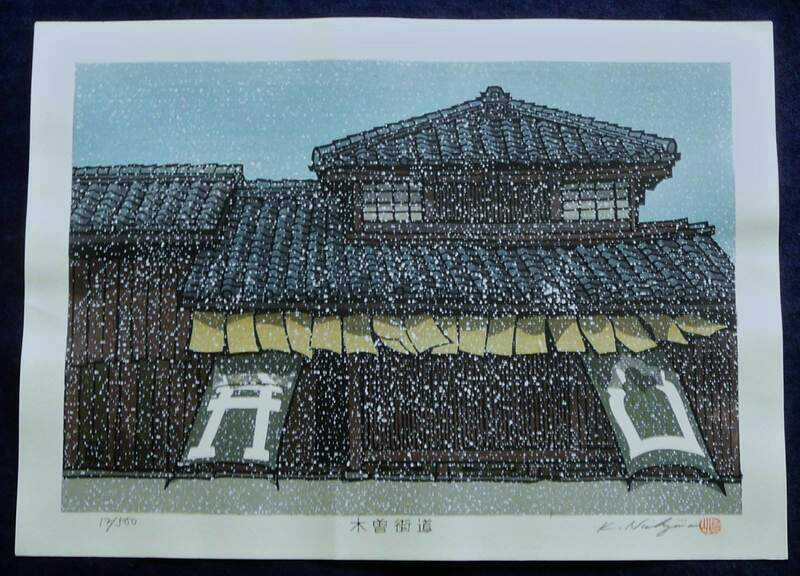 This word is the Kanji word for Jima so in Kanji his name is Nishi-shima. 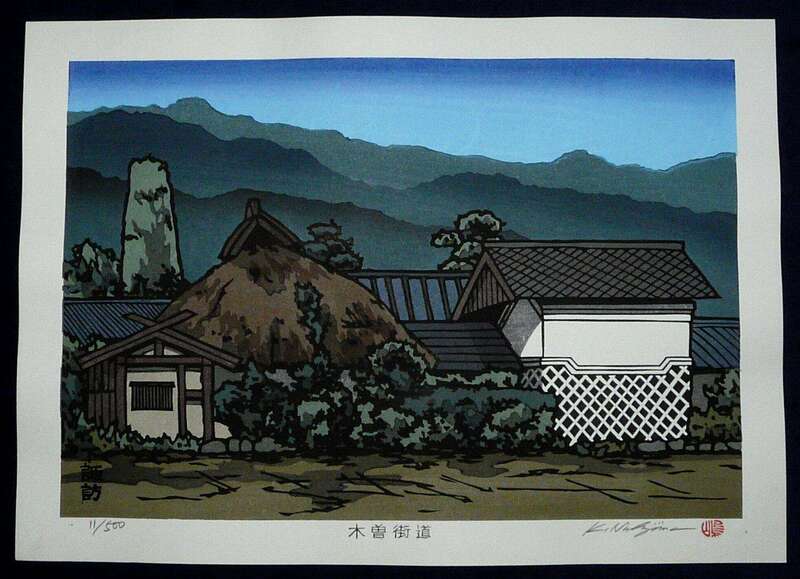 The scene is now almost impossible to find as it was one of his most popular, especially for Japanese buyers. 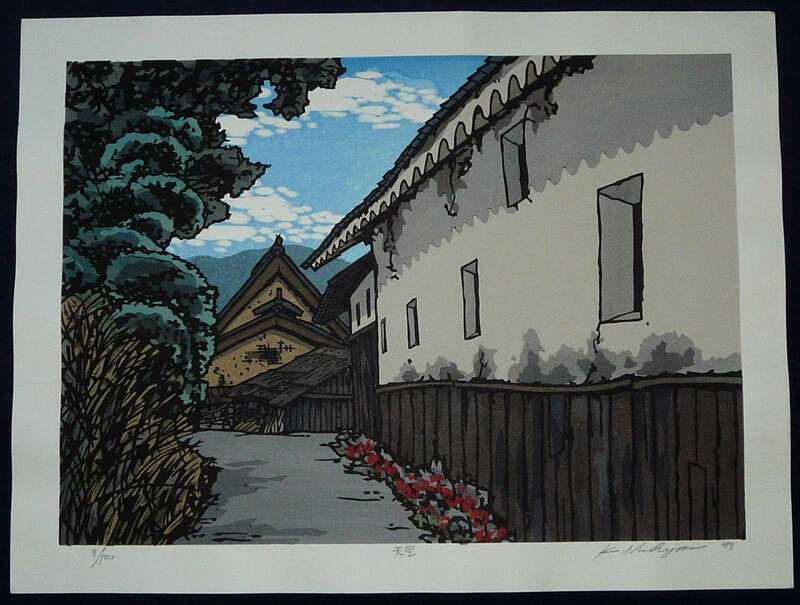 The scene shows an historic ware house in a Gion Laneway, Kyoto. The scene is a Gion Cafe devoid of customers on a snowy winter’s day. 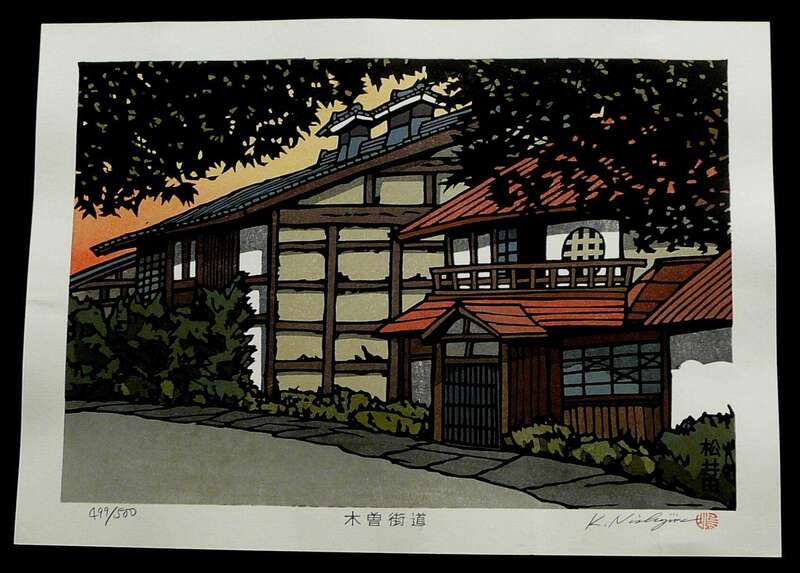 The scene shows a Traditional Country House at dusk. 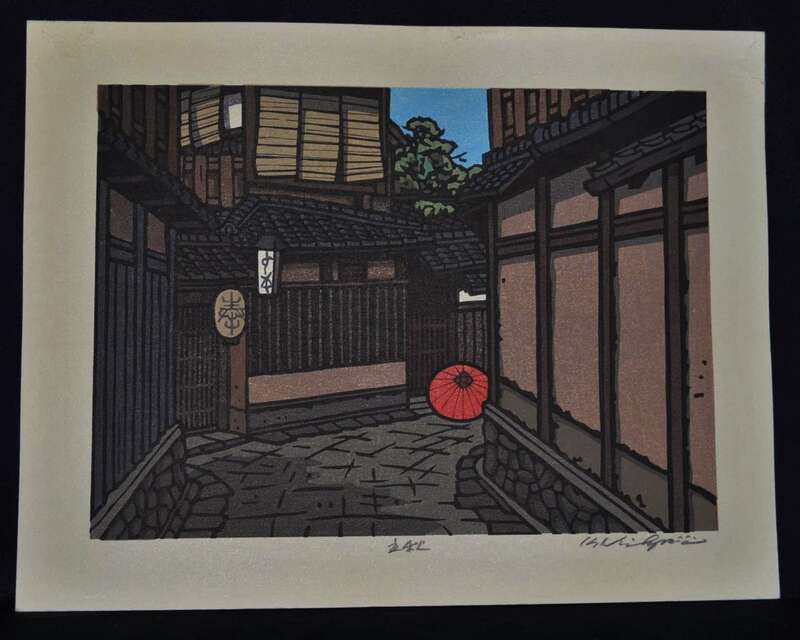 The scene shows a Gion alley in summer. 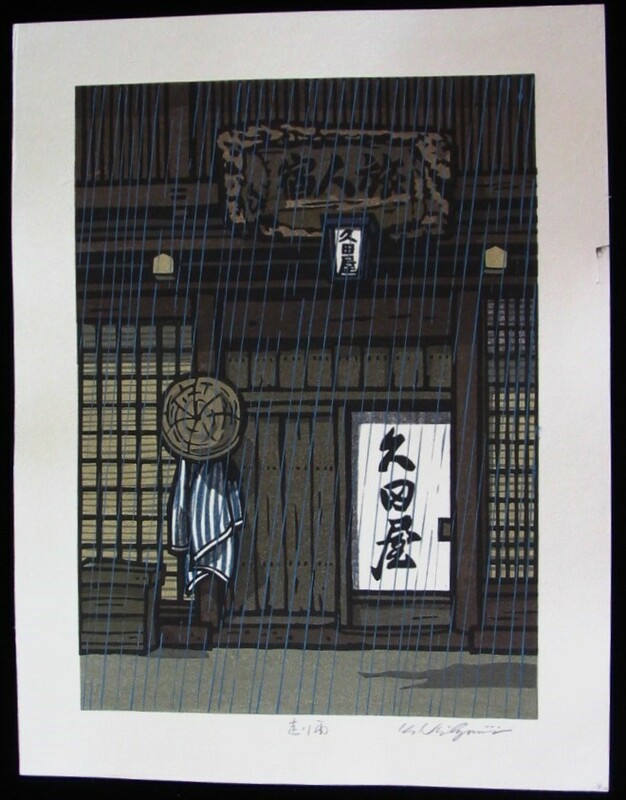 The scene shows a Rain falling on a tradition restaurant in Gion. 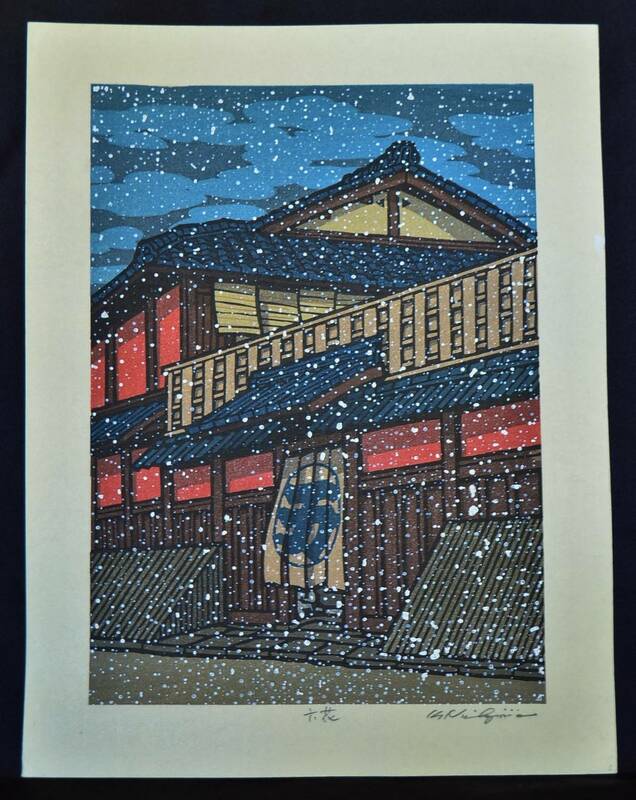 The scene shows a holiday in Gion. 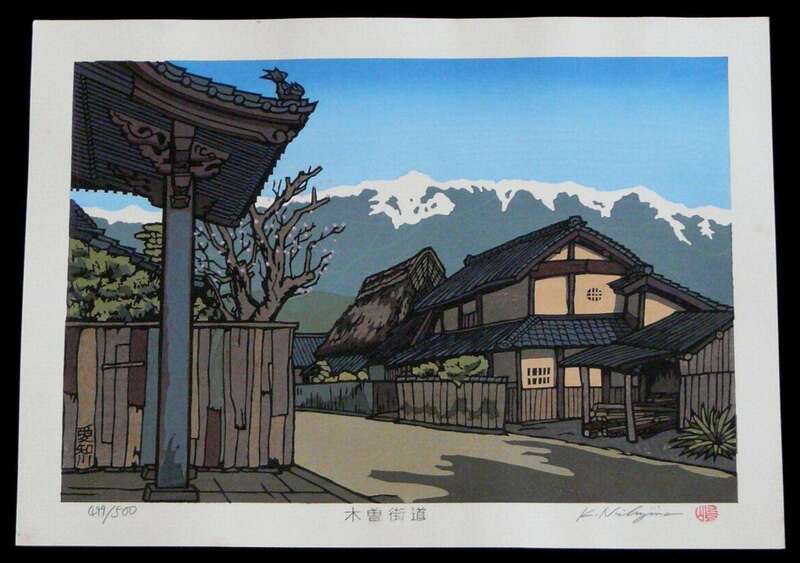 The scene shows a sunny day in Gion. 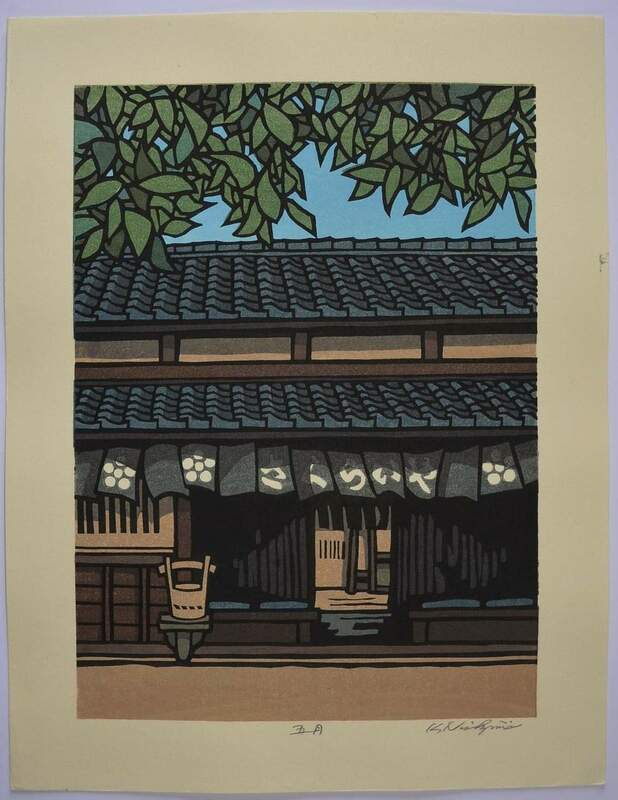 The scene shows a restaurant in Gion. 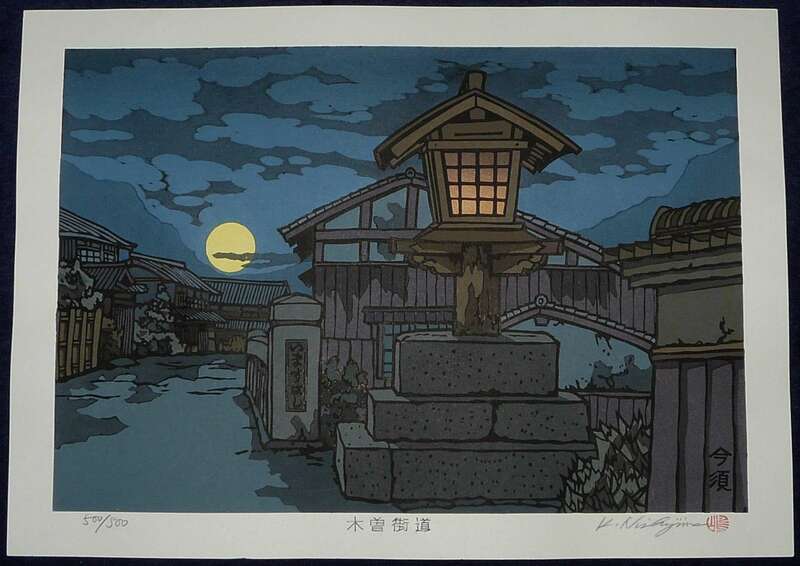 The scene shows evening coming in Kyoto. 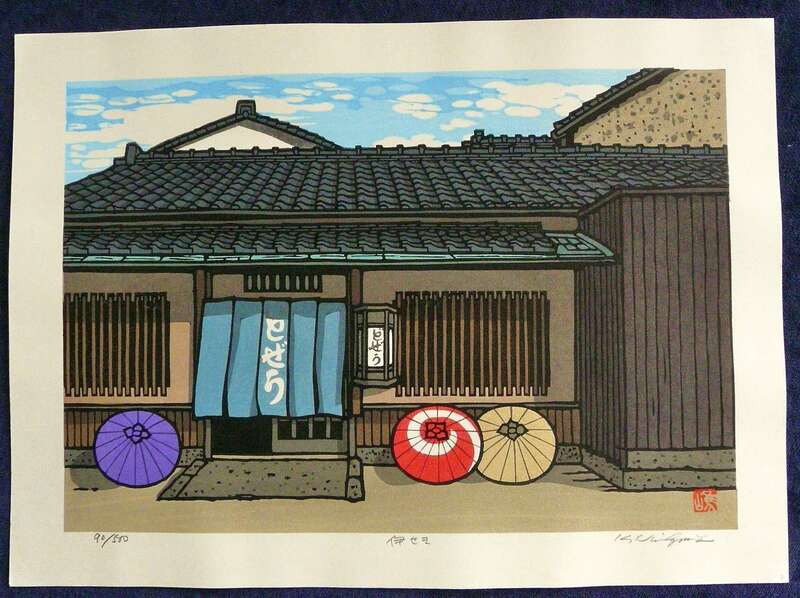 The scene shows a shop in Gion. 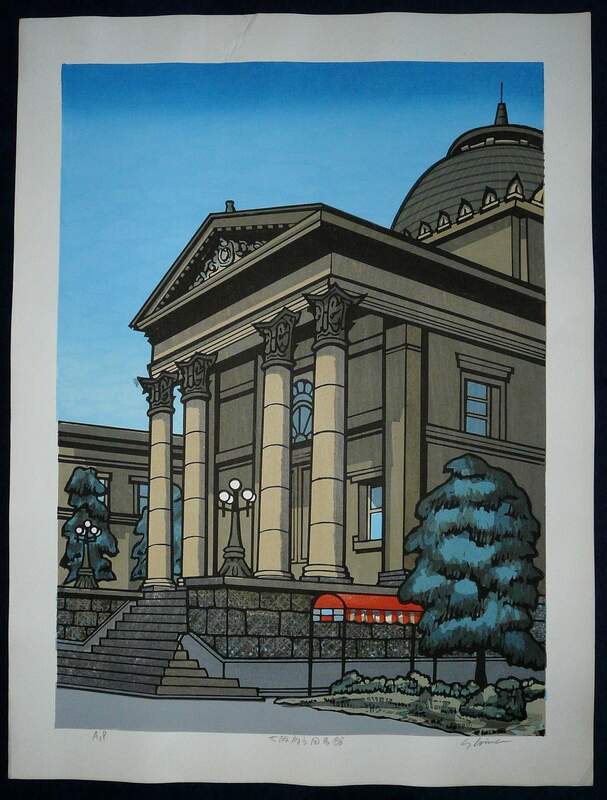 Only 500 of each of these First Limited Edition scenes were ever printed and they are all Hand Signed, Titled and Numbered in Pencil by the artist and show his Red Seal in the bottom right corner of the scene. They each measure 43cm x 31.5cm (17 inches x 12.4 inches) and these scenes are no longer available for purchase direct from the artist. 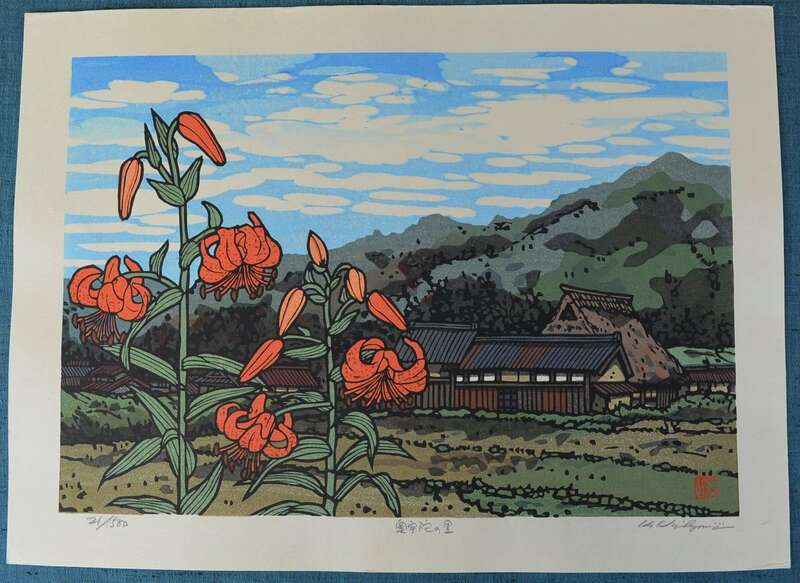 Most are now almost impossible to find in Japan and if any can be found they must be purchased from woodblock print dealers who have had them archived for many years so the prices are very high and continue to rise. All of our examples have been in safe storage for a number of years. 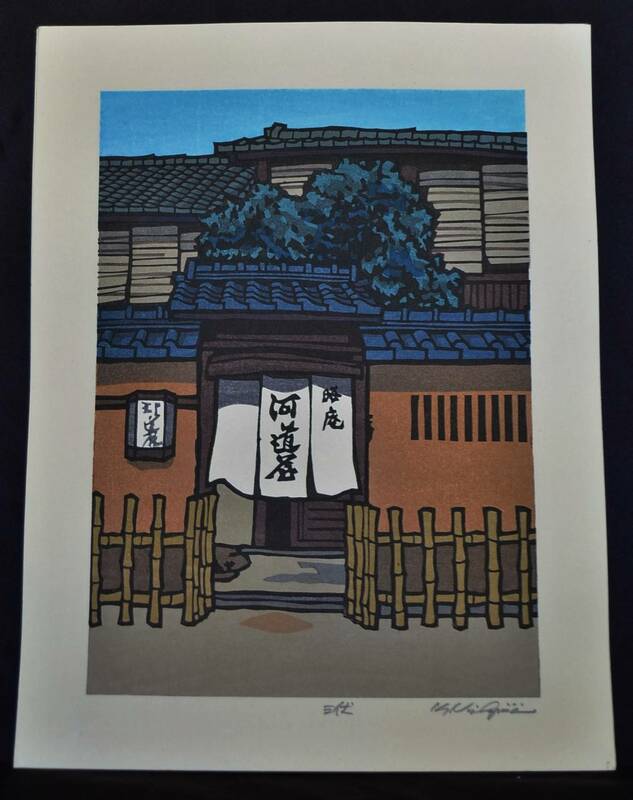 Print Number 38 of 500 Limited Edition. 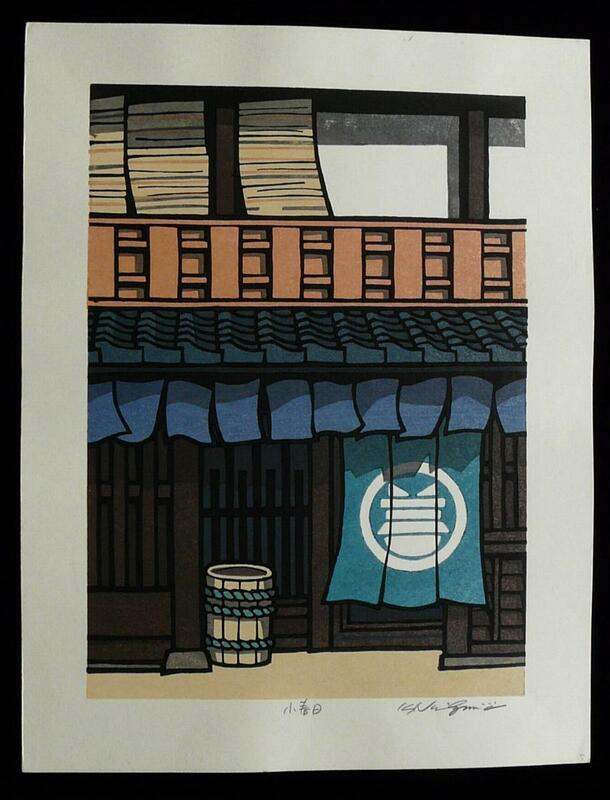 Shows an Historic Store House in Machiya. Hand Signed, Hand Numbered and Hand Titled By The Artist in Pencil in the Bottom Margin. 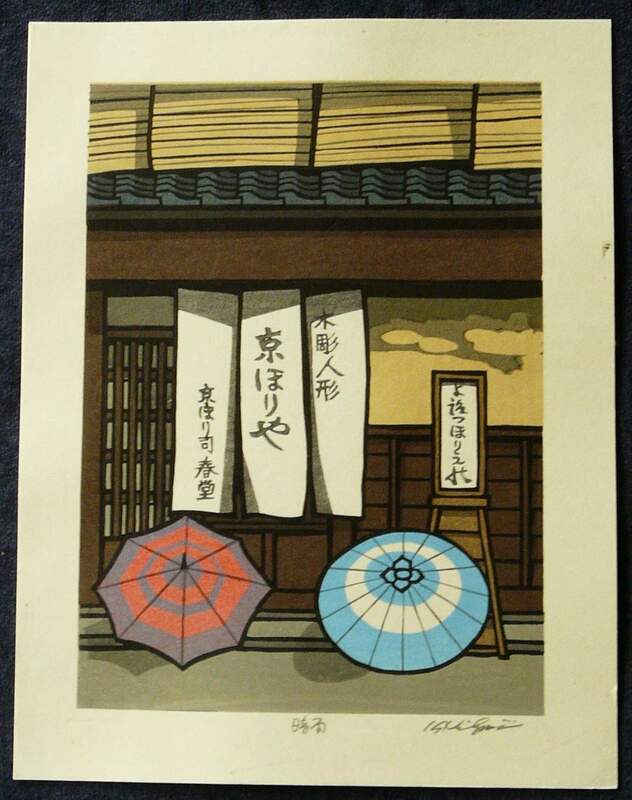 It Also Shows the Artists Red Shima Seal in the Bottom Right Hand Corner. 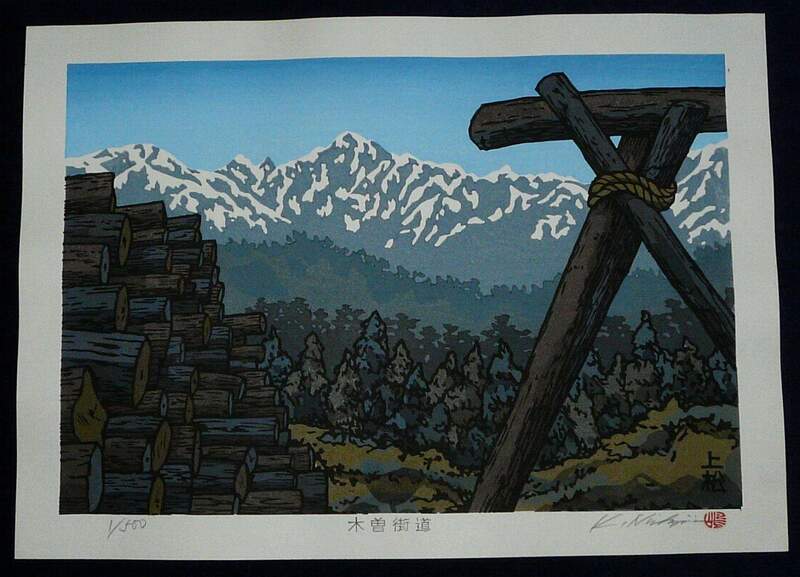 Print Number 146 of 500 Limited Edition. Print Number 21 of 500 Limited Edition. 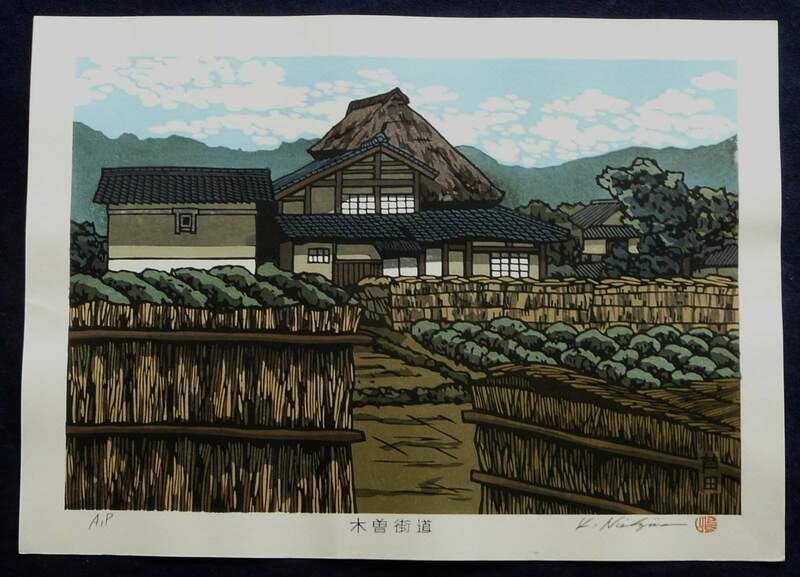 Shows a scene of a Village in Oku-Uda, Nara. Print LOW Number 2 of 500 Limited Edition. 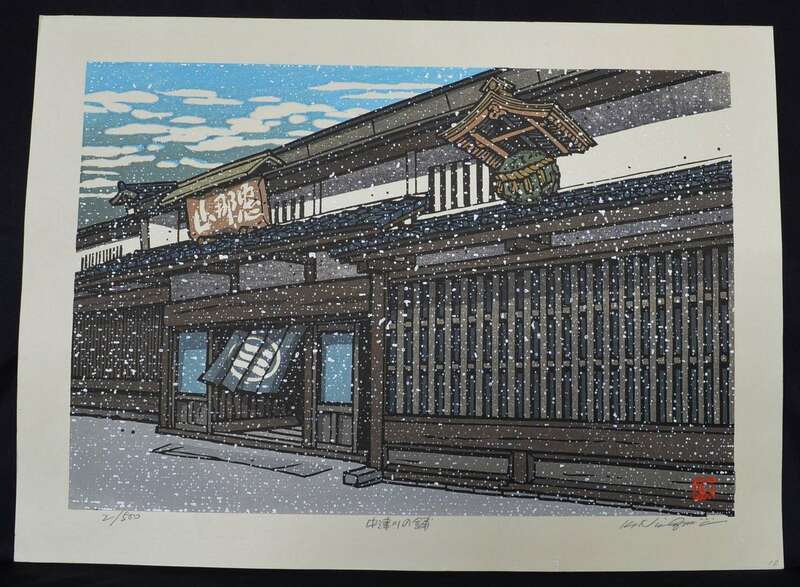 Shows a scene of a restaurant in Gion with the snow falling. 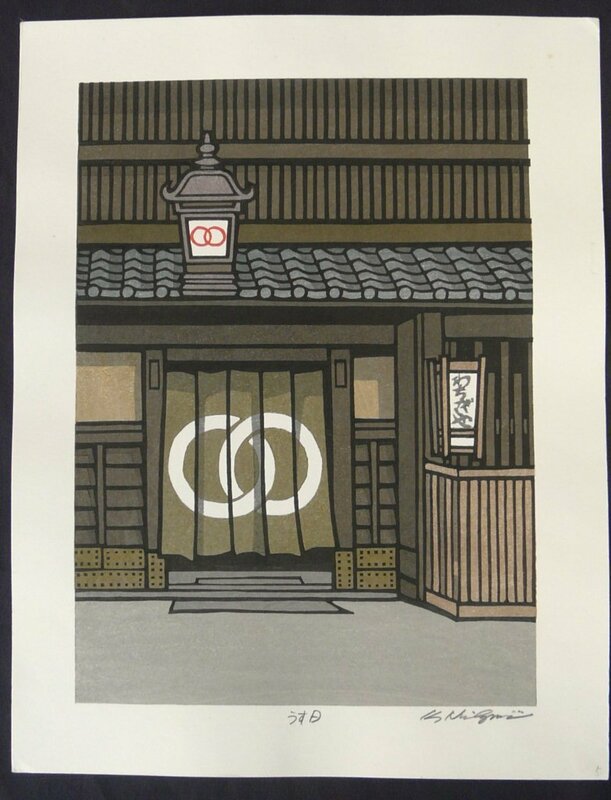 Print Number 90 of 500 Limited Edition. 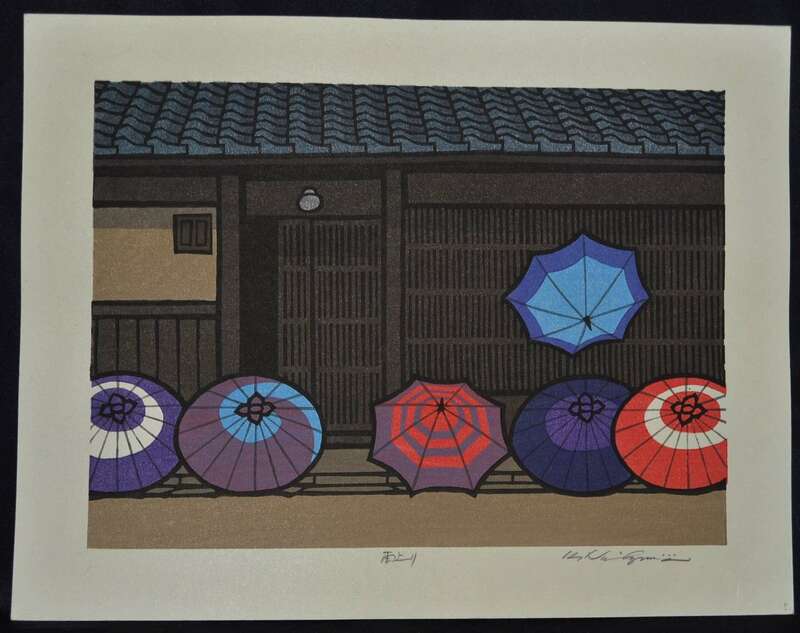 Shows one of Nishijima’s iconic umbrella scenes in Gion and title refers to the three umbrellas which remain in the front of a cafe in case the rain returns. 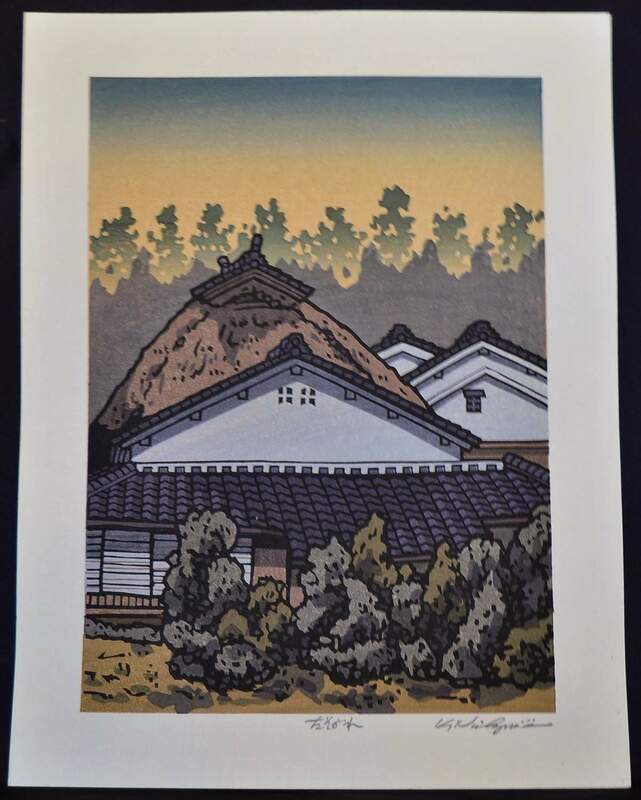 Most of these scenes are now almost impossible to find in Japan and if any can be found they must be purchased from woodblock print dealers who have had them archived for many years so the prices continue to rise. All of our examples have been in safe storage for a number of years. 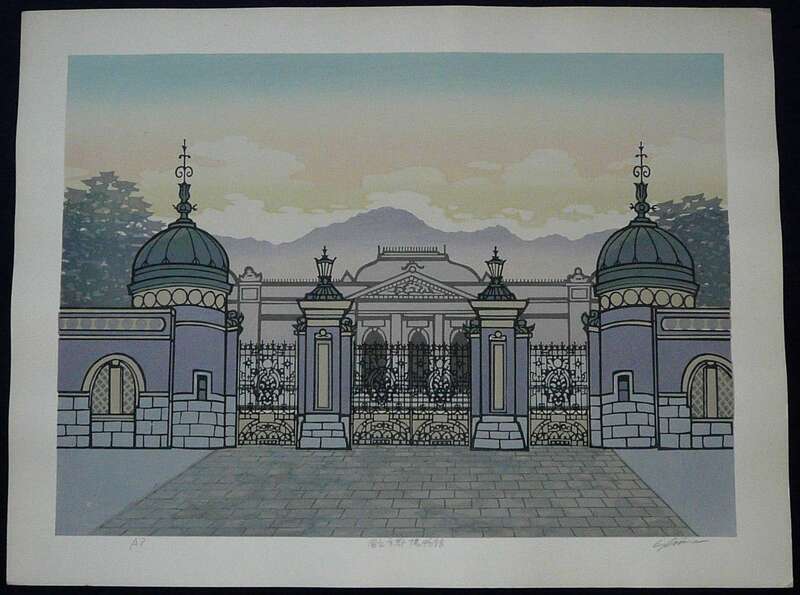 THE FOLLOWING WOODBLOCK PRINTS ARE OF LARGE SIZE, ALL FIRST LIMITED EDITIONS and from a SERIES ON THE KISOKAIDO TRAIL which was Created by the artist in 1979. 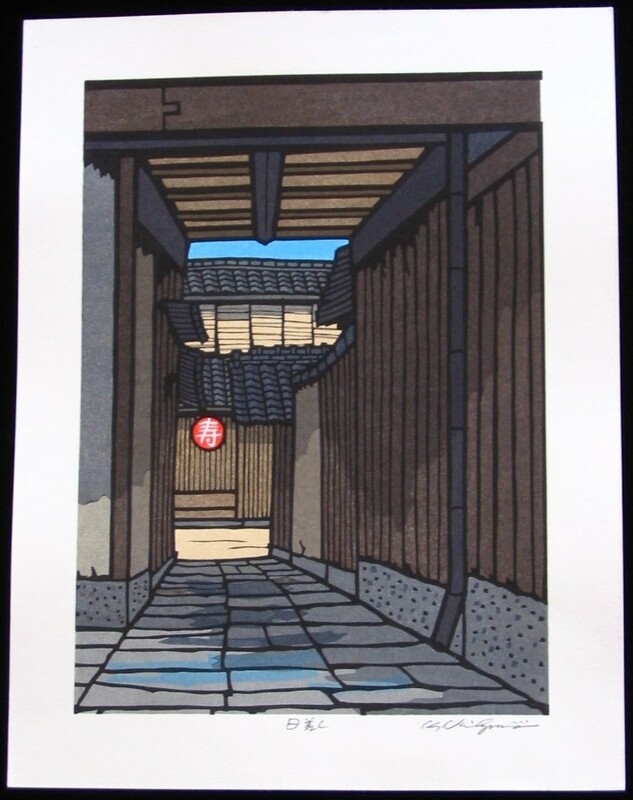 All are hand signed, hand titled and hand numbered by the artist in pencil in the bottom margin and each scene displays his Red Shima Seal. 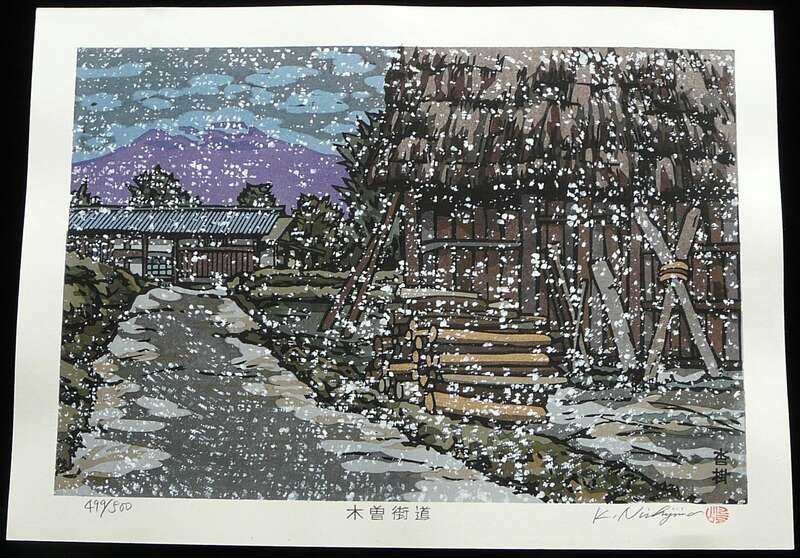 Only 100 of each of these First Limited Edition scenes were ever printed and they are all Hand Signed, Titled and Numbered in Pencil by the artist and show his Red Seal in the bottom right corner of the scene. They each measure 61.5cm x 46.5cm (24.2 inches x 18.2 inches) and these scenes are no longer available for purchase direct from the artist. 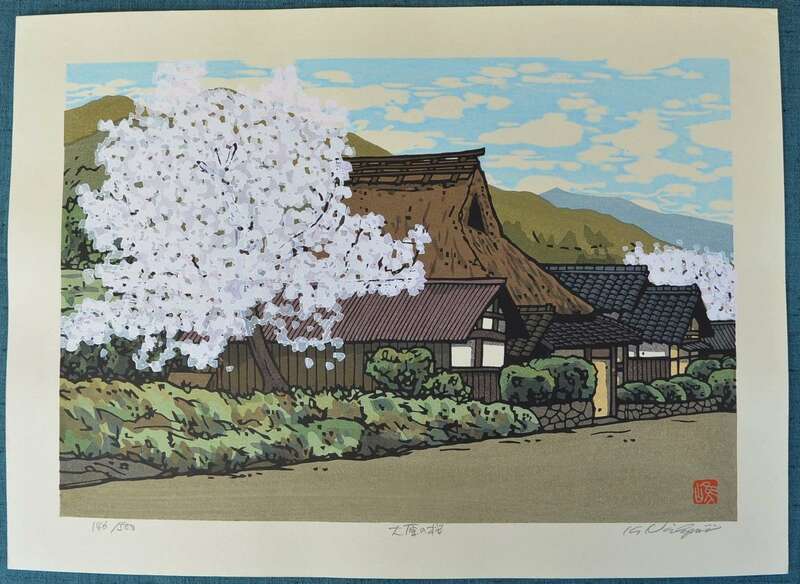 All are now almost impossible to find in Japan and if any can be found they must be purchased from woodblock print dealers who have had them archived for many years so the prices are very high and continue to rise. All of our examples have been in safe storage for a number of years. Print Number 15 of ONLY 100 Limited Edition. 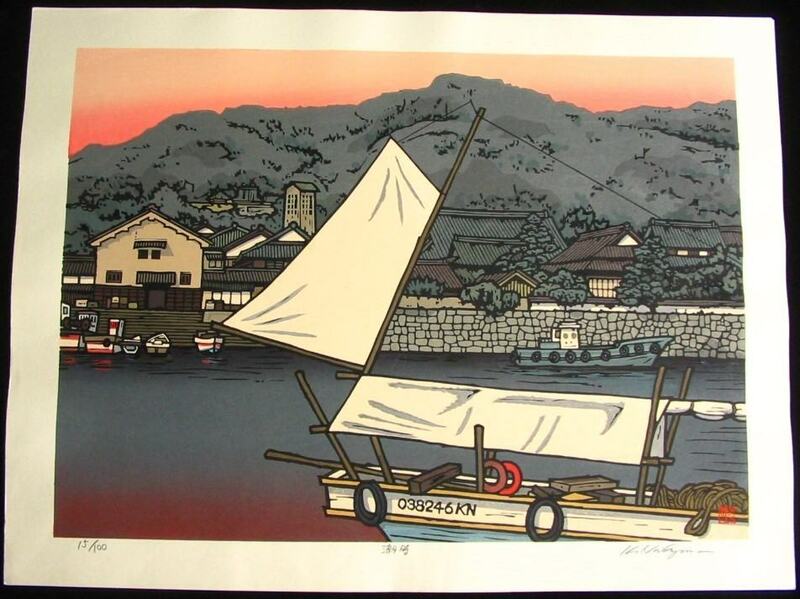 Shows a scene on the Port of Tomo in Fukiyama – the Prefecture of Hiroshima. 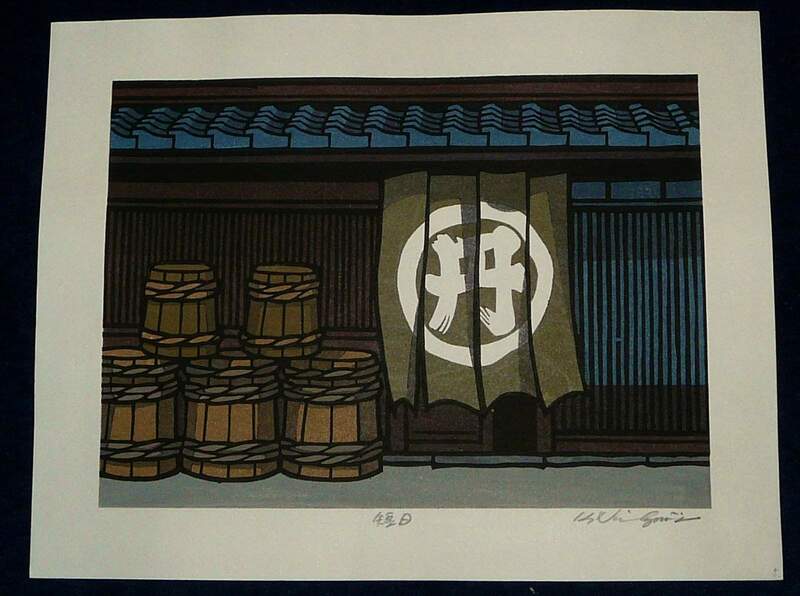 Print Number 8 of ONLY 100 Limited Edition. 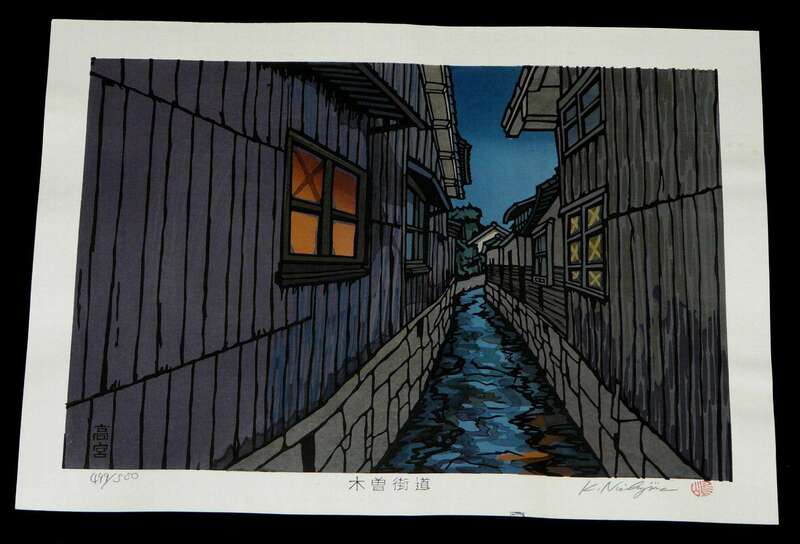 Shows a scene of a quite laneway in Kyoto. Hand Signed, Hand Numbered and Hand Titled By The Artist in Pencil in the Bottom Margin. Hand Signed and marked as A.P. 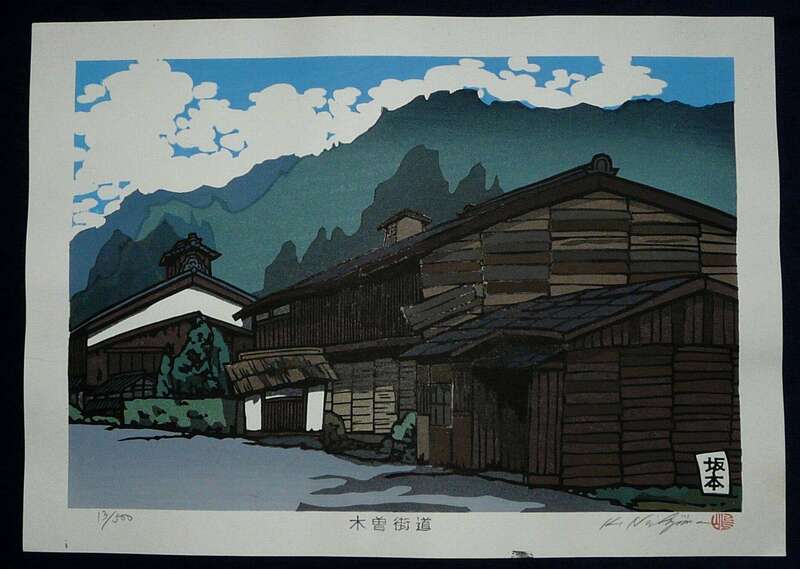 – An Artist’s Proof, the Very FIRST woodblock print created by the artist of this scene. Our research suggests it is a VERY EARLY work from the 1970s.